What do you get when you combine the winning combination of a smaller (1.6L) common-rail turbodiesel engine with a revised ratio 5 speed transmission, and a particulate filter? 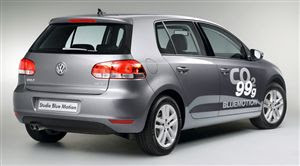 74 MPG, and only 99g/km of CO2, thanks to the 2009 VW Golf Bluemotion. This car still has 104 HP (184lb/ft), which is more torque than some gas compact cars have now- and you can bet that those numbers will all but double with a few basic fuel and air mods. In terms of mileage and emissions, this car puts some hybrids to shame- yet with its simplistic design, it will remain much more affordable (£15,500 starting) than cars with complicated hybrid technology. There is no word as to when this car will be brought to the U.S. (as usual), especially with oil prices dropping again, but at least we can have the comfort of knowing it's out there.